Theron and I have returned from serving in the Philippines, Urdaneta mission in Self- Reliance Services. Being self reliant is defined as the ability for us to provide the necessities of life for ourselves and our family members. 16 And now, if your joy will be great with one soul that you have brought unto me into the kingdom of my Father how great will be your joy if you should bring many souls unto me. That one soul that I must bring to the Father is myself. While Serving him in the Philippines I developed a stronger, broader testimony. I know without a doubt that God hears each and every prayer. That is not to say he always gives the answer we want, but he answers. He teaches us, he guides us and directs us and if we are obedient to that guidance that path we take will be the one leading to eternal happiness. Even when times are hard I know God is sustaining us in our efforts. I also know that God will not make us be obedient, he will not make us receive blessings, he will not make us witness miracles, because the choice is ours. That is why prayer is so important. We must always turn to our Father in the name of our Savior, with an unobstructed view of God's eternal plan and he will always provide direction for us. The scripture goes on to say if your joy, being my joy is great, then I should share it.I love being a missionary. I know I must continue to be an example to others so that they can be brought into the kingdom of My Father. Couple missionaries are needed so much to be an example to the world of what we can do to provide for our families and how we can live with the blessings given from our Heavenly Father. I learned so much during our mission.I have learned that the more I teach and testify the more my own testimony grows. The greater is my conversion. And we are taught that "when thou art converted, strengthen thy brethren". When I say I know the Gospel is true it means all of the Gospel. I do not pick and choose parts to believe or parts to obey. As I prepared to come home from the mission field I got very excited to see my family and friends again. It helped me to understand the desire of our Father in Heaven to again have all of his children with him. Our Heavenly Father is never far from us. Neither did we leave our family to go far from them. Our family was very much with us. Our parents were with us as we remembered the things they taught us as we were growing up. They were the example of how to be united as husband and wife. It was rather funny when we first arrived in Rosales and went to church that first week. We looked around and saw no families, no husbands and wives sitting together. When we left the chapel and walked into the Sunday school room the men were on one side and the women on the other. We pulled two chairs together in the aisle and sat side by side. Theron was rather bold and asked them "is nobody here married?" As hands went up he asked them to sit beside their spouse. Many times throughout the 18 months we reminded them to sit beside their husband or wife. When we walked into Sunday school our last week there it was very noticeable that couples were seated together. Does that fall under self reliance? Yes! Being united as a family is part of God's plan. Our Heavenly Father promises us if we follow his plan, if we rely on his words we will be blessed with greater peace, hope and progress. We will have the ability to provide the necessities of life for ourselves and our family members. We took our children with us. We were able to talk to them frequently. No we were not limited to a phone call only on Mother's day and Christmas. Our children invited us to attend FHE and family prayers with them. We were able to use the miracle of technology to be together. We received council from our children in many things. We selected different study topics and studied together the gospel doctrine. We called upon Jessica's help in counseling a young bishop and his wife at the loss of their newborn baby. She shared her experiences with them. She gave them strength through her testimony. She showed her love again, at the loss of their second baby exactly one year later. Jessica and Bishop and Sister Abalos have developed a bond in the Gospel and a love for one another just as Christ taught. Our children and with your help, facilitated in sending much needed clothing to the missionaries and members in the Urdaneta mission. We received over 50 white shirts that were distributed to the missionaries and new converts. There were over 200 neck ties and there were many pairs of navy blue school uniform slacks in the boxes. The young Aaronic priesthood boys looked very nice dressed in new church clothes. There were even several pairs of nice shoes. More than 50 little girls were given nice dresses to were to church. The Bishop had the biggest smile as he watched 3 little girls walk into church wearing matching purple velvet dresses the morning after he had distributed them. The relief society sisters were so excited to see that there were also new church clothes for them. That day in church you could see the effort all the members had made to wear their best. The reverence was remarkable that day as they came to partake of the spirit of the meetings. Our grandchildren were very much a part of our mission. We shared with members short videos of grandsons bearing their testimonies. Riley attended many meetings and firesides with us. When we had no accompaniment or prelude we used songs that Riley had recorded for us. One night at the beginning of our mission we had been counseling with a couple struggling in their marriage. We taught from the Proclamation for Families. The couple had their 9 year old son with them. I gave him my iPad as a diversion and let him look at pictures of our family. After we finished we were standing in front of the church in the dark visiting and he turned on a recording of Riley singing "A Child's Prayer". The Brother is not a member YET, but when that song started playing he stopped talking and with tears down his cheeks he sang along with Riley. The Brother sang this same song to us as we prepared to come home. He told us that we were the answer to his prayers. That he had prayed for someone to come help his family. His wife had been ready to leave and go abroad to work and leave her husband and three children alone. He told us that it was a miracle and God had answered his prayer. His family is doing well. He is not yet ready to be baptized but they attend church together every week. How long does it take for God to make a miracle. So many things need to be put into place. Two weeks after arriving in the Philippines we received a phone call from a Brother in Hong Kong. He told us about the huge number of sisters who had left their families and were living in Hong Kong. A program was being put into place for the Philippine Missions and the Hong Kong Missions to work together and bring the Sisters home to be reunited with their families. Some time after that Theron and I attended a fireside one evening and a Sister gave me her business card. She was a distributor for USANA. A couple of weeks later I was cleaning out my purse and found the card. I was going to through it away and for some reason decided to hang on to it. Three months later we were asked to work with a family in bringing the mother back from Hong Kong. As we worked with the 17 year old daughter and her father we found they were in extreme debt. Over 1/2 million pesos in debt. Mostly owed to illegal 5/6 loans. One loan was for Nicole to buy a starter kit to be a USANA distributor. Once she had paid the money her mentor left her with no training of how to do business. A useless kit and a big debt. There was a small miracle business card in my purse waiting it's turn. I called the Sister whose name was on the card. and asked for her help. She was able to sell the products that Nicole had. The money was used to negotiate the payoff of a 13,000 loan with the 9500 cash that was made from the connection on the small business card. It was not a coincidence. It was a well planned miracle. Nicole and her father are working hard to pay off their debts in the Philippines and the mother has two months left to finish paying off the loans in Hong Kong. Nicole is serving as secretary in YW and her father is first councilor in YM. He is a home teacher and was able to go to the temple in August to receive his endowment. The family will be reunited shortly and will attend the temple to be sealed for eternity. After teaching a self reliance fireside in a small branch we received a text from a sister asking how she could use the program on her own. Her branch wasn't real interested and was not supporting to classes designed to help them. This sister was living in a one room hollow block house. She had one light bulb, no refrigeration, no running water, and a one burner hot plate to cook on. Her husband was a loader for the RC Cola truck. He would travel around on top of the truck from town to town delivering soda. He would return home every couple of weeks and give her a little money. She had a four year old daughter and was five months pregnant. She wanted to believe in the blessings promised for peace, hope and progress. We met with Diane and told her she could continue to use the same program and materials as the branch would have used. But that it would be her obedience and the guidance from Heavenly Father that would make it successful. She was discouraged because she felt like she had no ability. As we talked we were amazed at how proficient she was in speaking english. We suggested that she use that skill to help her find work. When Diane went to bed that night she layed in bed praying about what she could do. She got up in the middle of the night and drew a picture on a scrap of paper with her daughters crayons. She advertised that she would tutor students. She posted the flyer on her high school alumni page and went back to bed. When she woke up the next morning she found a response and had her first student. God wants us to be successful. He wants us to prosper. We just have to trust him and do as he asks us. We must take action to allow his blessings to come. Another miracle we saw involves our ward here. This miracle started over 30 years ago. When Jessica was 4 years old she wanted to learn to speak sign language to communicate better with her grand mother. She took classes and taught classes and collected a small library of sign language text books. Our first Sunday in the Philippines we were introduced to the Bishop and his 12 year old son Gerico. Gerico is deaf. He communicates with very limited sign language. In talking with Gerico's parents I learned that they use ASL in the Philippines. The problem is they have no text books for the student and no teaching given to the parents. They have a very limited means of communication. I asked Jessica if she would send me her books for Gerico. It took two months for them to arrive but he was so excited. Now the family can learn together. Call it a miracle. In the books that she sent was a Gospel dictionary. Terms in the church that are not commonly used elsewhere. I received a text one evening from Elder Kloepfer, a young missionary serving from Idaho. He asked if I had any knowledge in ASL since I was from America. Elder Kloepfer was teaching an investigator that is deaf. A non-member teacher from the special ed school was interpreting for them but was having to finger spell everything because she didn't know the Gospel vocabulary. I explained that we had already had books sent over and I would make copies for him. Another coincidence? Or part of the miracle? The day that we were making the copies I read a facebook post from the mother of the young missionary, Sister Christiansen, who happens to be the granddaughter of Bob and Char Buckley from our ward. Sister Christiansen was telling her mother about a young girl she was teaching who also was deaf. We were able to provide her with the materials she needed to be able to better communicate with this young member. You may never know what part you play in the miracles that God is performing. But If you will listen and respond when the spirit prompts you will be part of many miracles. We didn't leave our home and family to go on a mission. They were there with us because as our grandson said " Grandma and Papa are on a mission in the Philippines because WE are a family that serves." Towards the end of rainy season in the Philippines our mission president scheduled a three day retreat to Puerto del Sol in Bolinao for a Senior Couples Seminar. Bolinao is the furthest municipality northwest of our mission center Urdaneta in the province of Pangasinan. We stayed in the resort Hotel Puerto del Sol. It was beautiful there and the weather was perfect. We had seminars each day with opportunities to be taught by President and Sister Deyro as well as by Elder and Sister Jensen and Elder and Sister Anderson. We had wonderful meals together and lots of time to share ideas, teach one another and to be taught by the spirit of the Holy Ghost. 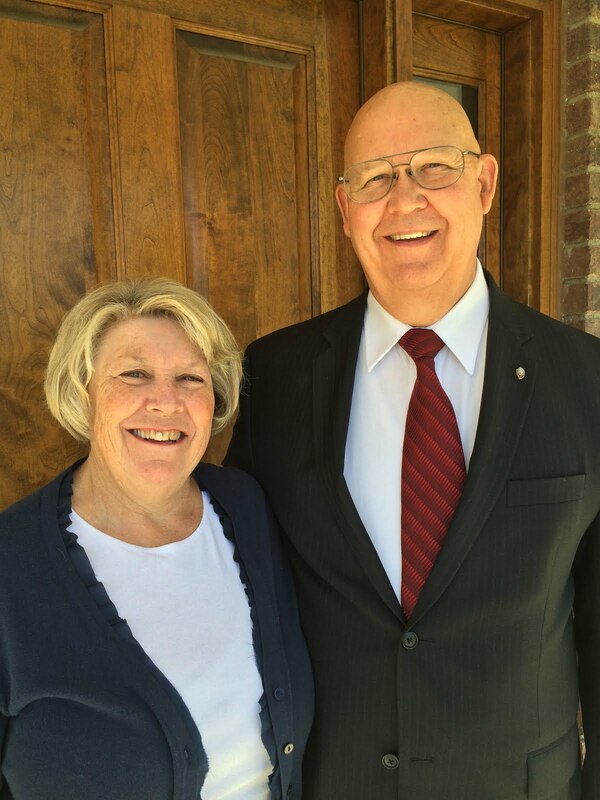 Elder and Sister Jensen are currently assigned to two Districts in our mission and have been given the assignment to help them both qualify to become a stake. This requires a lot of work on their part, training leaders, looking for less active members of the church and updating records. They taught us about mapping where they mark on an internet map the location of a family. Unlike the USA where most people have a physical address that can be found, the Philippines uses landmarks and other descriptors to locate people. We had a discussion on the progress towards stakehood for these two districts considering the words, "What Lack I Yet?" Working with the young Elders and Sister Missionaries many people have been found and invited back to church. Each individual is important and seeking and finding and inviting is one of the sweetest parts of serving a mission. Some may think that they have not attended for so long that they are forgotten or not members any longer. This could not be further from the truth and it is wonderful to see the light in their eyes when they are invited to come again and be with us. Elder and Sister Anderson taught about the correlation of Missionary Work and Self-Reliance. Many of the members who do not attend church do not have the money to pay fare to get to church. Some may feel other pressures of money that keep them away. Through self-reliance training people are taught how to start or grow a business to provide for their family. Others are taught how to get more education and if needed they can qualify for a PEF (Perpetual Education Loan) from the church to help pay for tuition and books. Others may want to enroll in a course called My Job Search where they are taught how to use the skills and talents they already have to qualify and receive a better job. President and Sister Deyro taught us several seminars including Lead like the Savior and Equally Joked Together. We had one discussion lead by them where we each wrote the name of our spouse and then wrote words that describe them that begin with each letter of the name. This was fun and was the basis for some great discussion about how blessed we are by the person we chose to many. You may notice that two of the Elders have the same name. When President Deryo told me last year that the Jensens were coming to our mission he said, "I think someone is Salt Lake is playing a joke on you" and then proceeded to tell me that Elder Jensen's first name is the same as mine. We ate all our meals together and they were all wonderful, Good Food and Great Friends to share it all with. It was off season at the hotel so we almost had it all to ourselves. Each afternoon they would come from the restaurant with menus to ask what we would like for dinner that night. We would give them the request and when we entered the restaurant they were ready for us with the table all set and would shortly bring our meals out. The food was really good. This is a floating restaurant with each dining room being a private Nipa Huts on pontoons floating in the river at the inlet to the sea. After order food and beverages a small boat tows the Nipa hut restaurant up the river and then back down again. It was so nice and relaxing. I have no idea how long we were there, probably about 1 hour going upstream and less coming back, simply lost track of time. The scenery was beautiful, it was so nice and cool on the water, just a wonderful afternoon. We did not pick our restaurant Nipa Hut but notice the name - Zian (Zion) when they seated us. We also had a little down time to just enjoy being with our spouse and with each other. Bolinao is a beautiful place, we took a tour of the area and were able to get some good pictures. God has created such a beautiful world for us to enjoy with so much diversity. We are truly blessed to be serving in in the Philippines. The land and water are so pretty but the Filipino people are kind, generous loving people almost beyond description. They love the Lord Jesus Christ and reverence God the Father. We finished the three days together with a testimony meeting and of course more pictures. The spirit was so strong in our meetings and we all came away refreshed, enlightened and highly motivated to continue our service in the Philippines Urdaneta Mission. As I prepare to go home from the mission field in three days, I become very excited to see my family again. It helps me to understand our Father in Heaven's desire to be again with all of his children. It breaks my heart to see so many families here in the Philippines leave their families and go abroad looking for something they think is better than what they already have. What is it worth to set your family aside looking for things of the world. Heavenly Father promised you an eternal family if you work hard and follow his plan. The world has promised you nothing but asks you to take a chance that things might be better if you give up on your eternal promises. Don't sell your families eternity for your wants of today. Ellen Villanueva I agree with you sister Anderson. And I think I can relate what you're saying. I've been away from family for 2yrs. last 2010-2012, It's been the hardest experienced in my life... to think like many others for the "FUTURE" of our children. But as days passed by when I was in Hong Kong, I realized that there's nothing most important in this world than to be with my family. working abroad it takes a lot of SACRIFICES. I asked advice from my branch president, and he said I have to go home with my family after I finished my contract. It takes a lot of prayer with that decision...I asked guidance from my Heavenly Father... till such time I decided to came home... my life after I went home not become easy, but one thing I am sure my Heavenly Father always keep His promise to bless His children as long as we Obey!!! I always apply the advice of my branch president in Hong Kong that when everything went wrong always follow your "Heart" and you will never go wrong. and it works!!! Some times we have to exercise our FAITH in order to see the true Miracles in life... Heavenly Father love His children. Only us sometimes have not enough Trust on Him... Life is good if we always put our trust to the Lord!!! Stay in the boat, Hold on and Wear your life jacket! We cannot be the lifeline for someone else if we are not securely strapped into our own life jacket. 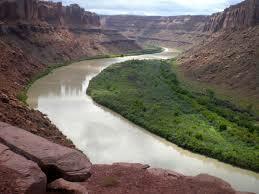 16 years ago, my friend Gary and I took our families on a canoe trip down the Green River. 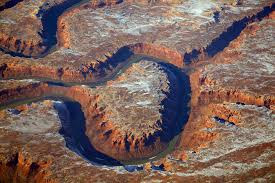 We started the trip at Green River Utah and went to Mineral Bottom, west of Moab Utah. A beautiful 4 day trip of about 68 miles. Now before I go further I need to tell you something personal about myself. Many of you will find this hard to believe but here is my confession. I am a very stubborn man. When I was a little boy, I was a very stubborn child. Fortunately I had a Mom and a Dad who knew how to teach me. I have also been blessed with a Heavenly Father who knows me as He knows each of you. Just as we know our children and know what they will do in certain circumstances, He knows what I am likely to do. Now with that in mind, let’s go back to the river. On the second day down the river, the water was very calm, very smooth water. About midday most everyone stopped for lunch and to stretch their legs on a beach. My Daughter Jessica was sharing a canoe with me and when we started to shore she cried that the mosquito's were too bad and said she did not want to go in. She is very allergic to them and each bite swells more than expected. So we floated a little further down the river where we found a place in the shade of the cliffs and stayed there in the canoe to have our lunch and rest. It was cool there, no bugs and totally calm so we laid back to take a nap. At some point I took off my life jacket and used it for a pillow. (Bad idea… more to come on that subject) We stayed there about an hour and then took off when everyone else came along. We were bringing up the rear with Gary in the lead. 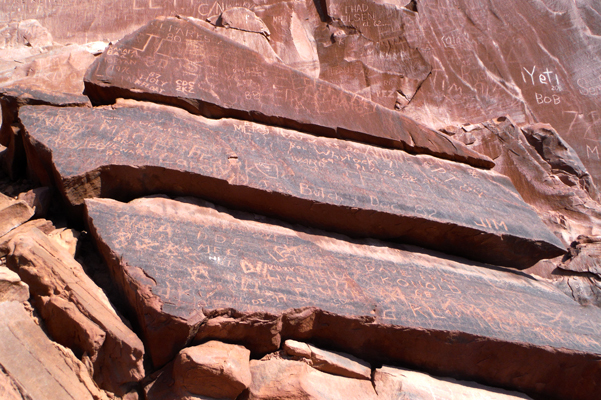 Almost too late, Gary realized we were almost to "River Register" at approximately mile 77.5 where people have written their names for years and years back to the time of Major John Wesley Powell. Gary wanted to stop and hike to river register so he started hollering for everyone to go to shore. The Canoes were in the middle of the river had to turn the canoe sideways across the river and even paddle a bit up stream to get to the shore. I told Jessica that we should take a more direct approach (bad idea number 2) so we started to angle directly to the beach. When we got close to shore we saw that there was a big rock sticking out of the river a little so we tried to get past it on the side away from the shore but we were way too close to it. When we got to the side of it the current grabbed our canoe and sucked us sideways and promptly turned the canoe upside down throwing us out into the water. Remember the life jacket? Well it was still on the seat right in front of me but no big deal I’m a good swimmer, I have no shoes on to weigh me down, I have a cotton tee shirt and cotton Dockers so I can swim easily. Everything is tied in the canoe so again no big deal. My oar is not tied and is floating right in front of me so I grab it and start swimming to shore. Jessica is yelling something about my life jacket and is trying to pull it free from the canoe. All of a sudden I am going down in the water. That eddy is churning and sucking on the downstream side of that rock and it wants to take me to the bottom. I am kicking and swimming as hard as I can but I can’t get my head above water. I manage to get my head up about twice for quick breaths and as I go down the third time I’m thinking, If I don’t get up now I am through. I will continue this story with Kyle’s account. Kyle is Gary’s youngest son and was only 13 years old at the time. Quote “Well, we had about four to five canoes and one kayak and we would trade off and on with the kayak. It was my turn in the kayak and we had to stop at this one stop called Register Rock. There was a rock in the middle of the river that everyone had to go around and came back into the spot where we wanted to go except Theron. He went in between the rock and us on shore. He went facing across the river sideways when he tipped over and didn’t have his life jacket on. At that time I was barely getting to shore when my dad told me to get out there and help Theron. So I pushed out there and I tried to go up stream into the eddy, but it was a real strong current. I could see his head bob up and down in the water so I went over to where he was I couldn’t see him. Then I felt something at the back of the kayak, I yelled to him to grab on. As I turned and looked back I saw him hanging on the back so I pulled down into safe water and over into the bushes.” Close quote. Now I was under water when I heard Kyle yell at me to grab on. I reach my hand straight up and there is the kayak. I grab the back of it and pull myself up out of the water. I am exhausted and can hardly do anything but hang on. Jessica swims to me with my life jacket yelling at me to put it on (she is crying). She helps me get my arms in it and zips it up. Now after it is over I am told that Allen (my son) was on shore and already took his jacket off to go hike to register rock. He runs and jumps in after me with no jacket. Luckily Kyle saved me before Allen had a chance to get sucked into that eddy. Was I lucky that day or did God know I was going to be stupid and stubborn. Gary’s wife Lesley yelled at me to put my life jacket on just a few minutes before the accident. I told her I was a good swimmer and the water was calm and not to worry. Was I lucky or did the Lord prepare a 13 year old boy to save me from myself. I am sure that if Kyle had not got to me when he did I probably would have drowned. Was I lucky or was I again blessed with another miracle in my life. Kyle is the youngest on the trip, I am the oldest. He is the smallest, I am the largest. What do you think? I know that Heavenly Father knew I would do something stupid that day and he helped a 13 year old boy learn to kayak and prepared him to save my life. I heard him clearly tell me to grab on. I didn’t hear anything else but I heard that! How can I hear that when I am underwater in a river current that strong. The Holy Ghost is the answer. I know that God lives, I know that Jesus Christ is His Son, our Redeemer who atoned for our sins. I know the Gift of the Holy Ghost is real and that He is the comforter. I am thankful that I am allowed to learn and progress on this earth, that I can make mistakes, sin and repent of those sins and be forgiven. I know that I need to be a little bit better today than yesterday and better tomorrow than today. I testify of these things in the name of Jesus Christ, Amen. This week Typhoon Karen came to visit the Philippines. Early Sunday Morning around 2AM the rain became relentless. The wind was blowing constantly through the night but not as hard as had been predicted. By morning the area around our apartment had a lot of standing water but not sufficient to flood the apartments. Power was out when we awoke and was off for most of the day. This caused no hardship for us. By the time it was dark outside the power resumed and has been fine since. This Typhoon was pretty much a direct hit on where we live, however, we did not see much damage at all. Monday we went to Dagupan and some other towns around and saw very little flooding. The biggest problem we saw was rice which was ready for harvest that had been beaten to the ground. That will cause some hardship for the farmers. We visited the Member Welfare Project in Pozorrubio and there was no damage there. The roof they had recently install to keep the pigs dry was all intact. Last October we had Typhoon Lando visit us and the damage was a lot more severe. Here are some pictures from Lando. I have no pictures from Typhoon Karen as she was so kind to us. There is another Typhoon headed towards us for later this week but it is tracking north of us and we are praying mild winds and rain.